The revolutionary Roundhouse livestock building has won the Royal Institute of Chartered Surveyors’ South East award for design and innovation with its new larger Roundhouse, built on the farm of Alison Eggert-Hobbs at Fulling Mill Farm, near Haywards Heath, West Sussex. The building was erected in 2012, and was one of the first of the larger Roundhouses (RH45’s) built. This is twice as big as the original 30m diameter Roundhouse building (RH30) and has a diameter of 45 metres, a circumference of 282 metres, and an internal area of nearly 1500 sq metres. Consequently it can hold up to 300 beef animals at 500 kgs, and 200 dairy cows – twice as many as the RH30. Mrs Eggert-Hobbs uses it to house the cows and progeny of her 100-cow Simmental beef herd. The judges praised the design for its positive impact on animal welfare and the environment. The design and construction of the RH45 building was an engineering challenge because of the forces and weight involved in doubling the size, according to Mr Simpson. For example, the RH30 is made up of 14 tonnes of steel and a single sheet of high-tensile PVC coated polyester fabric, which can be manouvered into place by hand during construction. The RH45 consists of 46 tonnes of steel, with the roof made from two sheets that are joined together in-situ. There is no need for any supporting walls to either of the buildings, and a fully open side is best for farmed livestock due to the excellent “chimney stack” ventilation characteristics of the building’s design. However there may be a management need for outer walls for stock such as pigs, or to help provide young animals with a microclimate during the winter, or if the building is used for horses. Both buildings are erected from ground-level using a hydraulic lift pack, thus eliminating the risks of working at heights. Farmers are attracted to the Roundhouses because of their animal welfare advantages, as they have been designed with the natural herding instincts of farm animals in mind; because disease levels are lower due to their excellent ventilation (the air comes in evenly all around the building and out through a hole in the centre of the roof); and because of their safety: there is a dedicated handling system in the middle of the building and gate free access and escape routes from each pen. “Thirty years ago my father was nearly killed by a bull,” says Mrs Eggert-Hobbs, who farms with her husband Max and her father David Hobbs. The building’s welfare benefits were also an attraction. “Good welfare will become ever more important and I want to be prepared. Three or four years ago I was rearing bull calves and had big problems with pneumonia. It was so disheartening - I was pulling out dead calves nearly every day and spending a lot on the vet. In the end I just put them outside and I probably only got one case after that. It was a big eye opener and made me very conscious of ventilation and air flow,” she adds. 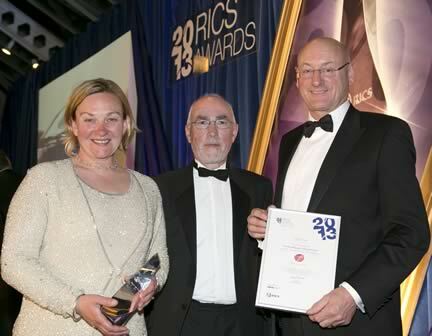 The RICS award was presented at Denbies Wine Eastate, Surrey, on 16 May 2013 by Terry Adsett FRICS, member of judging panel.